Potatoes are one of the easiest plants that you can grow at home. Planting potatoes is quite easy and fun. Learn how to grow them in your garden with the given guide. Generally people think that a large garden space is needed to grow potatoes. The fact is that the potatoes can be grown in ground, pots, tyres, buckets, barrel or any container in a small place, even in balconies! I have grown potatoes in an old wheelbarrow, a big grocery bag, an old laundry basket and a handmade brick enclosure. The procedure and tips for growing them are the same. There are several types of potatoes, each has its unique characteristics and use. You can grow any type of potato with the following instructions. Autumn is the planting time for potatoes when it start becoming warmer. In frost free areas, they can be planted any time from Autumn to early summer, but not in very hot temperatures. In frost prone areas, you can plant in early spring, just prior to the last expected frosts. Position : Where to grow Potatoes? Plant potatoes in a sunny place, but never allow the tubers to be exposed to direct sun light. The most important point in getting good potato produce is to select the good seed. Potatoes are planted from last years tubers and not from seeds as many may think. Ensure that the potatoes you keep from the last years crop for sprouting are fungus free. It is best to buy certified seed potatoes from nurseries. These are virus and disease free and produce a good yield. Place the seeds potatoes in a warm dry spot in a dark box with some holes for air circulation to sprout. These are known as cheated potatoes. Large seed potatoes can be cut into pieces and planted keeping at least one 'eye' or sprout upwards. Let the cut pieces dry for a few days before planting or else they may rot. Choose a place in your garden where you have not grown potatoes or tomatoes for five years. Dig the soil and mix plenty of well-composted cow manure and compost (garden soil). As the plants grow about 25 cms high, continue mound up around each plant loosely from the sides of the trench. Continue adding soil leaving a few inches of the plants, creating loose mounds of soil where potatoes will grow. You can add compost, straw, paper cuttings or rotten animal manure, sugarcane mulch, etc. to make the mounds. Mounding up around the plants is very important. It covers the roots and the young potatoes to protect them from the sun and at the same time reduce weeds. This will encourage a much heavier crop. This method involves no digging of ground. The beauty of this method is that you can grow potatoes on top of lawn or anywhere! Put a thick layer of 6-7 newspapers or thick cardboard sheets (from the old packing boxes) on the area where you want to plant potatoes. Spread your seed potatoes on top of the newspapers about 30 cm apart, trying to get the shoots pointing upwards. Cover with another thick layer of straw, manure and compost mixed together. Water well. The rest of the method is the same as that for growing in ground. Keep potato plants watered especially after the bloom as the potatoes need water to swell into full size potatoes. Water in the morning so that the leaves can dry in the sun to avoid any disease. If your potatoes are brown at the center or they are hollow or soggy, reduce the water. When the leaves of your potato vines start to turn yellow and die back, stop watering for next two weeks. It is time to harvest your potatoes. Potatoes generally do not need any fertilizers if the soil is enriched with compost and animal manure. Or you can mix some blood and bone in the soil or a general purpose granular vegetable fertilizer. You can spray 5-10-15 liquid fertilizer on the leaves before the plants bloom. Avoid a fertilizer rich in nitrogen. Nitrogen will produce leafy growth and less tubers. Too much fertiliser reduces the flavour of potatoes. Potatoes accumulate heavy metals like cadmium, so avoid fertilizers which contain these elements. Mulch is better for potatoes than fertilizer. Pests like aphids, flea beetle and Colorado Beetle make holes in the leaves of the plant. The flea beetle lays eggs on the back of the leaves and the larvae move down to eat the roots. Colorado Potato Beetles have black and yellow strips which lay their yellowish eggs in clusters. Remove from the leaves by hand or a brush. All these pests can be controlled by treating with an insecticide soap. Lady bugs near your potato plants will eat aphids and beetle eggs. growing garlic near your potato vines can also control the pests. Diseases that can affect potatoes are early and late blight. Late blight is what decimated the Irish potato fields. Early and late blight is the most common disease of potato plants. The early blight shows as circular brown spots on leaves, while brown or purple lesions indicate late blight. Proper watering can prevent early blight. Use a fungicide to control blights and other fungal diseases. Potatoes need 60 to 90 days with warm soil to grow well for a successful harvest. Once the plants on top start to die, you can harvest your potatoes. I take out some potatoes from around the plants, as and when I need them. Or you can simply dump your container and spill potatoes on the ground. No digging is required! Each seed potato can produce 10 potatoes at harvest. 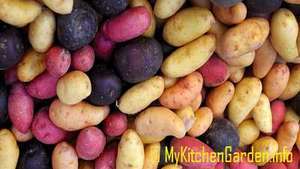 Once I put 1 kilogram seed potatoes and could harvest about 20 kg. If grown in ground, you can dig around the plants to pick some of the potatoes for use and cover up the rest. Dig carefully, avoid damaging the potatoes. Wash with water thoroughly and eat. Potatoes can be grown well in the same bed as Broad Beans, Cabbages, Corn, Horseradish, Parsnip, Peas, etc. Potatoes do not grow well with Cucumber, Onions, Pumpkin, Sunflowers, Tomatoes, etc. These are bad companion plants for growing potatoes.